I finally put these up on Etsy, now that the holiday buying season is over. Go me! Nothing like making your list of 2009 must-dos to inspire me to get them up there. 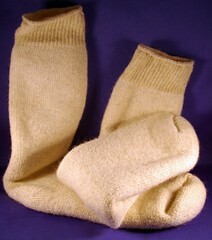 We had these knitted by Zellinger wool from the fleece from our 2007 crop. In other words, I still haven’t done anything with the 2008 crop. They are washable, so warm, so comfy. I am wearing mine almost all the time these days. Inside, I wear them like slippers and outside, they fit well underneath my winter boots. In the fall, I wore them with crocs, and if it is just wet outside and not too cold, I wear them under my Wellies. I’m charging $30.00 each. Tell me what shoe size you have and I’ll pick the right size for you. This entry was posted in ForSale. Bookmark the permalink. Post a comment or leave a trackback: Trackback URL.